This book was recommended to me by a fellow redditor from /r/Forex. Trade Mindfully: Achieve Your Optimum Trading Performance with Mindfulness and Cutting Edge Psychology is one of the books on trading psychology that provide valuable advice and actionable techniques. Another trading book of such a high quality level that I have read was Trading in the Zone by Mark Douglas. 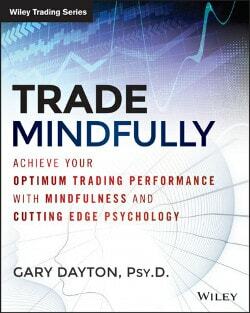 Trade Mindfully was written by Gary Dayton in 2014. Gary is a doctor of psychology, a trading psychology mentor, and a trader specializing in Wyckoff method and VSA in S&P futures and equities. If you are struggling with some common psychological problems associated with trading — like the fear of loss or predisposition to oversize your trades — this book will offer definite steps to overcome them and become a better trader. Although, the author uses mostly futures and stock markets in examples throughout the book, the problems he is talking about and the solutions he offers are pertinent to all kinds of markets, including the spot foreign exchange one. The whole book is based on the concept of mindfulness. It is a way of focusing one’s mind and attention on the present state of some activity — be it trading, educational process, reading a book, assessing one’s internal state, and so on. Mindfulness is closely related to the subject of emotional intelligence (emotion detection and management). You might be familiar with this term if you have practiced meditation or perhaps used mindfulness-based training in sports. The book applies mindfulness to the process of trading to enhance it with a set of the High-Value Actions and High-Value Mental Skills (called so by Gary Dayton). Mindfulness serves as the basis for dealing with emotions, making high quality preparations for the trades, focusing on the correct trade execution actions, and doing a fair post-trading analysis. Mindfulness is a skill, which requires not only learning but also regular practicing. In his book, Dr. Dayton offers several exercises to train this skill. Most importantly, he shows how it is applied in trading to improve the whole process and with it the results. This is what mindfulness practice helps us develop: a much more useful relationship with our thoughts and feelings from which we can better govern our behavior. This is what helps us reclaim control over our actions. The main idea of Trade Mindfully is that we cannot and should not fight our emotions or intrusive thoughts when trading. Doing so is futile and leads to stress and performance deterioration. With mindfulness we, as traders, can accept our emotions and disturbing thoughts, see them for what they really are — just feelings and thoughts — and deal with the trading situation based on our expertise, with all due attention and focus. Trade Mindfully is divided into three parts. The first part introduces some important concepts, for example, intuitive mind and deliberative mind. It also describes various cognitive biases, emotions, and psychological obstacles traders deal with. It also talks about why we actually need our emotions to trade successfully. The second part is dedicated to psychological methods that traders can employ to deal with their emotions, anxiety, and distracting ideas. This is where mindfulness practice is introduced along with some exercises a trader can do to enhance his or her emotional capacities. This part also teaches how to defuse from the unnecessary thoughts and emotions and how to accept them without engaging in unproductive fights. The third part presents the Before-During-After methodology for traders. It is based on three phases: High-Quality Preparation, Effective Execution, and Constructive Self-Assessment. Each of those three phases is based on its own set of High-Value Mental Skills and High-Value Actions. For example, the list of high-value mental skills for the preparation phase includes: perspective, personal awareness, self-motivation, and mental discipline. The list of actions for the same phase consists of: writing a trading plan, clarifying your role, demo trading, research, studying market behavior, identifying development needs, creating development goals, planning for the trading day/week ahead, and so on. Trade Mindfully is not just a book for reading and learning how to deal with your emotions in trading, this book is also a practical guide to train the necessary skills and to achieve your goals, step by step. Throughout the book, you will be encountering special exercises that have to be completed during various phases of your trading process. Some exercises can be completed in minutes, some will take you months as they involve long-term assessment of performance and method. Additionally, you will find some practical exercises to train your mindfulness, emotion defusion, and acceptance skills. These exercises are to be done on a regular basis and take about 10–30 minutes per day. The author’s idea is that once you read the book, you do not stop at that point thinking that you have become a disciplined, emotionally stable trader — you continue practicing during your whole career as a trader. And this book serves well as a self-improvement manual for traders. Mindfulness and other cutting-edge mental skills are skills and, as with acquiring any new skill, they require practice and effort. You are unaware of cognitive biases and the effect they might have on your trading. You are struggling with some emotional or psychological problems in trading. You do not know how to get rid of unproductive or destructive ideas when trading. You are interested in improving your trading process with mindfulness practice. You want a better organized process for your development as a trader — the book offers it in form of the Before-During-After methodology. You are interested to study the real cases of traders struggling with their emotional challenges and overcoming them using the methods offered by the book. You want to see how keeping good records can help you get better at trading. You are generally interested in psychology and wish to learn more about various experiments, studies, and surveys in the field. The first one is not that big but is still important — the Kindle version of the book costs $36.79 as of October 2016. I will not say that the book is not worth it, but the price for the electronic version of the book should be much lower in my opinion. The book can be read in about 12 hours, so it could not involve too much effort to prepare a digital version. The second one is a serious drawback, in my opinion. The book completely omits any mention of expert advisors and automated trading. Dr. Dayton simply writes at one point that trading without emotions is ineffective because the experiments (involving humans who did not have emotions due to damaged brain parts) have shown that without emotional guidance, the motivation for good results is lost. At the same time, algorithmic trading is completely emotionless and quite profitable as we all know. Also, many traders now automate parts of their preparation, execution, and self-assessment processes with considerable success. Clearly, those automated processes lack any emotions. I believe Dr. Dayton could address these issues in his next book. The last disadvantage is that Gary writes assuming that the reader already has a trading edge and that all his or her problems come from emotional decisions. In reality, most of the traders do not have a positive expectancy trading system and are struggling with emotions at the same time. Reading this book might help such traders to become less losing, but they still will be losing money to the markets even if they master their mindfulness skills. All that being said, I still recommend getting Trade Mindfully somewhere and reading it. It will not take too much of your time (until you start doing all the exercises of course), but it has a potential for becoming a pivotal book in your career as a trader, especially if you know that some psychological obstacles are keeping you aback. If you have any questions, comments or opinions regarding Trade Mindfully by Gary Dayton, please feel free to post them using the commentary form below.